Fortunately for my pride and dignity as a pop culture critic, the movie's actually genuinely good as well. So I'm not going to have to tie myself into knots defending a piece of crap, or excoriating a movie I really wanted to love. Instead, I get to praise something I consider praise-worthy, and that's always a nice feeling. 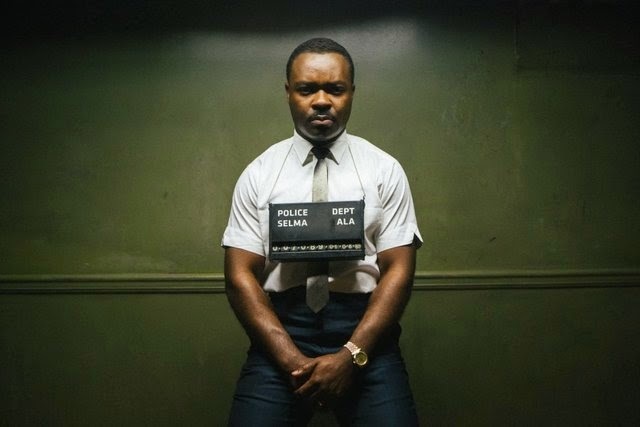 If anyone was just reading through the first few paragraphs in order to figure out whether or not I think the movie is worth watching,** this is your official indication that, yes, it is, and you should go see Selma at your earliest convenience. The film, which really is excellent, follows the leaders of the SCLC (Southern Christian Leadership Conference) as they decide to continue the fight for civil rights by tackling voter's rights in Selma, AL. Central to the story, of course, is Dr. Martin Luther King, Jr. (David Oyewolo), but right there alongside him are the other less remembered but just as important figures: Diane Nash (Tessa Thompson), James Bevel (Common), Andrew Young (André Holland), Bayard Rustin (Ruben Santiago-Hudson), Ralph Abernathy (Colman Domingo), James Orange (Omar J. Dorsey), and Frederick Reese (E. Roger Mitchell). Oh, and let's not pass over mentioning Amelia Boynton (Lorraine Toussant), John Lewis (Steven James), and James Forman (Trai Byers). I can keep going. The story kicks off with Dr. King accepting the Nobel Peace Prize for his civil rights efforts. It's 1964, and King has been steadily rising as the face of civil rights for almost a decade. 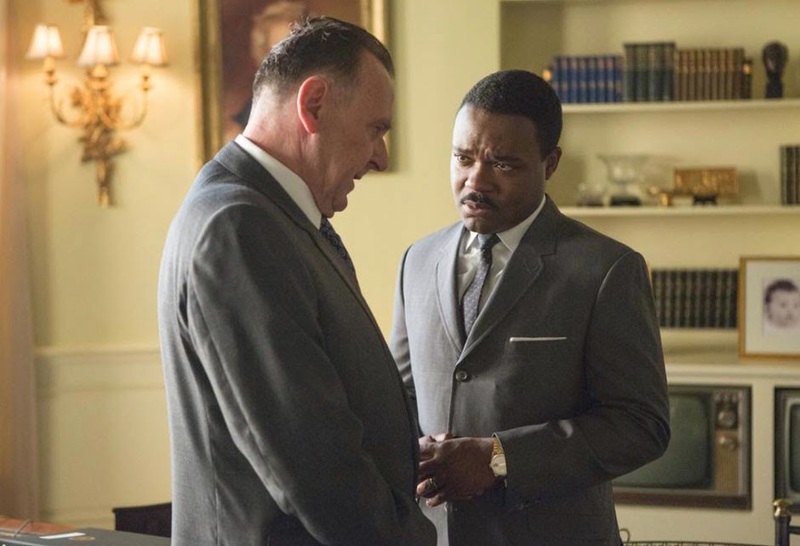 But while he's happy to get the prize, and grateful to steal a moment away with Coretta (Carmen Ejogo), it's just a few days before he's back to business, confronting the sitting president, Lyndon B. Johnson (Tom Wilkinson), about the vital necessity of a voting right's act. Yes, the Civil Rights Act has passed and ended segregation, and that's a great thing, but there's still a lot of work to be done. When Johnson refuses to even consider making voter's rights a priority, preferring to try to sway King into working for the "War on Poverty", Dr. King and the other leaders agree that they're going to have to get their hands dirty again. This time in Selma. What helps a lot here is that the film makes it abundantly clear why this issue, voter's rights, is so vital and complex. I mean, it doesn't really trip immediately to the mind as the direct follow up to the end of segregation. But, as King explains, it's crucial. If black citizens cannot register to vote, then they cannot vote, which means that they have no opportunity to influence their governmental representation. That can lead to a legislature and local structure that does not represent their interests. More problematic, though, is the fact that without a voter's registration card, one cannot be called up for jury duty, which means that when black citizens are tried for a potential crime, they come up against white juries that have been conditioned to see black citizens as inferior because they don't vote. It's a vicious cycle, and as King so aptly points out, it's central to creating a country where black citizens can actually live. And since reasoned, logical explanation isn't half as good as emotional drama at getting the point across, all of this torment and frustration is shown to us in a simple but devastating scene where Annie Lee Cooper (Oprah Winfrey) tries to register to vote and is turned down because she cannot meet the arbitrary entrance demands of the white registrar - demands that it is clear she has made every effort to meet and been turned down time and time again for simply being black. 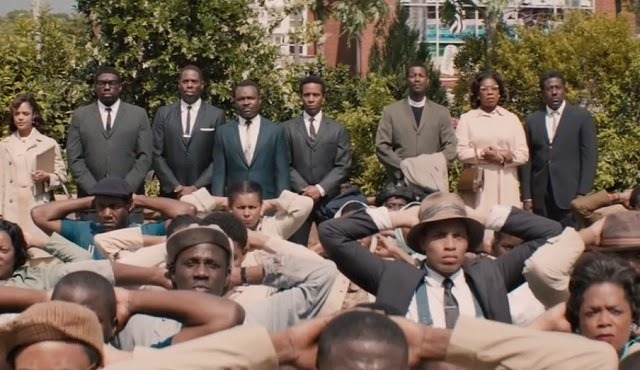 The movie follows the events of the protests in Selma and the eventual march from Selma to Montgomery, where King gave a speech on the steps of the state capitol to make it clear that voter's rights was an issue there to stay. The central conflict of the story involves that march and whether or not it will even happen - Governor George Wallace (Tim Roth) and his cronies make every attempt to end it by violent force and political maneuvering - but the real heart of the story isn't in the details. Because, really, the details aren't the interesting thing here. We know how the story ends. Roughly. The heart of the film then isn't what happened, but how it happened. As in, who were these people really? Who were the brave men and women who dropped everything in their lives to go to a foreign town and be brutally beaten in the name of helping some people they'd never met register to vote? And, most centrally, who actually was Dr. Martin Luther King, Jr.? For a historical figure we all seem to think we know, the film makes it very clear that we don't really know him at all. And that's actually pretty great. The thing is, there are really two different ways to dehumanize a person, and both of them come up in this film. The one most explicitly dealt with in the text is the way we usually think of dehumanization: the systematic, racist belief that some people are less human than other. That they're beasts. We see this in the way that the white government officials treat the non-violent black protestors. Insisting that they're all animals. Violently attacking them. Using horrible racist slurs and threats of even more sustained violence. These are all methods of dehumanization. But the other kind of dehumanization is actually, to my mind, more insidious almost because it's harder to see. And that is the dehumanizing process of making a person into an idol or an icon. Making a regular human being out to be more than human. Because that's dehumanization too, and while it's not treated as explicitly in the film, it is there, implicitly, in its challenging of how we all view Dr. King. I hope you get what I'm talking about here, but I'll rephrase just so we're sure. There are two ways to dehumanize someone: to make them out to be less than human or to make them out to be more than human. In both cases, the outside world has declared that a person or group of people is not human. And that's a very bad thing. It's easy to see why it's bad to make someone or a group of people out to be less than human, but it's harder to see why it's such a bad thing to make someone out to be more than human. And this is where the real genius of the film lies. Because if there's one example of this form of dehumanization in our culture it's in the way we treat Martin Luther King, Jr. We do not remember him as a man, but instead prefer to remember him as something more. Some superhuman megaperson who swooped down and created civil rights amen. We, and by "we" I mean the white community, don't like to admit that Dr. King was human. Why? Because it's harder. In a lot of ways, it's very easy to say that Dr. King was better than human because it relieves us all of the burden of following in his footsteps. If he's more than human, then we all have an excuse. He's better than us, and therefore we cannot be judged by the same measure. Dr. King is superhuman, so it totally makes sense that he was able to do things other men couldn't. Except he wasn't. He was a man. A very human man with a troubled marriage, some deeply problematic behavior patterns, and a history of not always making the best choices. He was a person. And it's crucial to remember that. No one wants to remember that. Sort of how the white community really glosses over King's outrage and frustration with white liberals. Or how we all just collectively don't want to talk about his calling out the Johnson administration for its Vietnam policies. We prefer to forget that he had a hostile relationship with the FBI and was targeted for some deeply illegal wiretapping and was even considered a possible assassination target by our own government. We don't want to confess that a lot of what King said makes us feel bad about ourselves. Guilty. And it should. 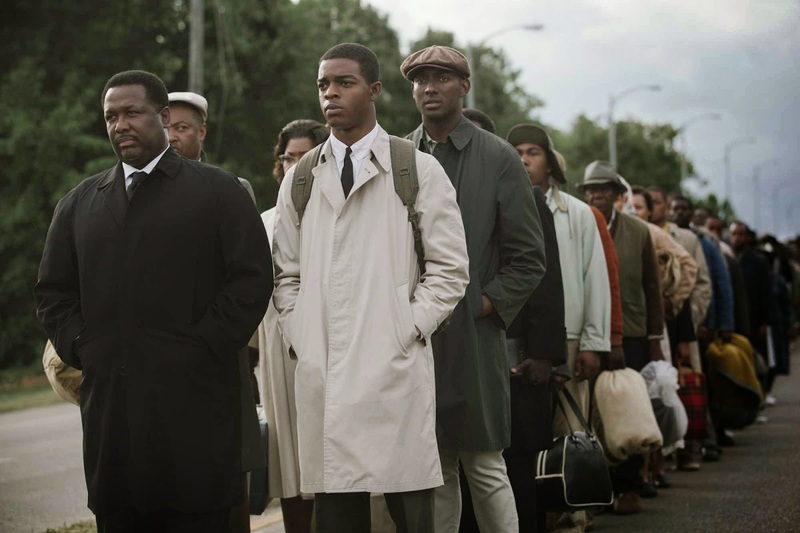 The value of this film is that by reminding us of the history of the civil right's movement without glossing over the hard stuff, it makes clear that the civil rights leaders, especially Dr. King, were all people. Normal, real people who decided to risk their lives and livelihoods for a greater cause. We don't like to remember that because it asks a really simple question: if they could do it, then why aren't we? Now, I don't think that the white liberal community has been on some sadistic and intentional crusade to muddy the legacy of Dr. King by conveniently forgetting his humanity, but I do think that's exactly what has happened. In taking great pains to praise him, we've forgotten that he was just like us, just better at it. David Oyewolo does, for the record, an amazing job in this film. 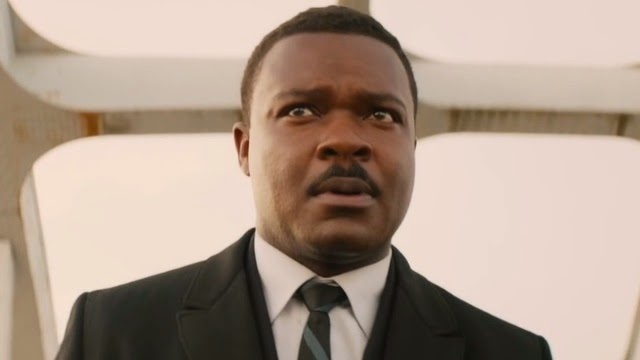 He manages to ape Dr. King's movements, speech patterns, accent, and even his facial expressions with eery accuracy, but he never lets the performance feel like a pastiche or impression. He just inhabits the character and lets you watch as Dr. King faces incredibly hard decisions in his life's work and in his marriage. He makes Martin's humanity undeniable, a living breathing thing on its own. He gives this historical figure we all prefer to remember as superhuman, he gives him flaws and vulnerability and moments of weakness. Pauses in the breath. Catches in his voice. Little tics and tells that suggest that Dr. King is as human as any of us and that arrest us with that awareness. The great success of this movie, I think, is not that it's a story about the "triumph of the human spirit", but that it very effectively humanizes a man we all forgot wasn't a god. Yeah, it's a great movie about a civil rights event that changed our country for the better. But it's also a movie about a very human man who didn't stop trying to do what was good even when his own failings interfered. And that's just as important. Seriously, if David Oyewolo and Ava DuVernay don't at least get Oscar nominations for this, I'm going to be very pissed. 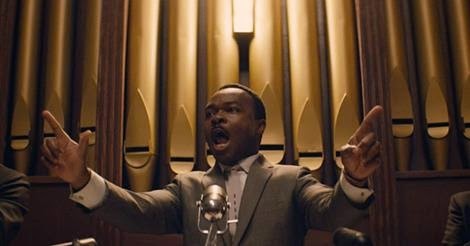 Also Carmen Ejogo absolutely kills it as Coretta Scott King, a woman committed to the cause but frustrated by the cost. *As exhibits A, B, C, and all of the letters, please see my obsession with Chariots of Fire. **My family openly does this. Especially my sister. Who I love.